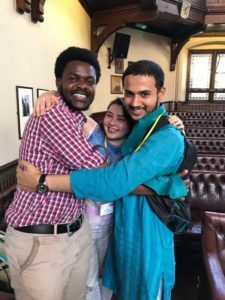 From May 26th – May 28th, Louis Dreyfus-Weidenfeld and Hoffmann Scholar Abhijay Negi attended the 2017 Global Scholars Symposium in Cambridge. 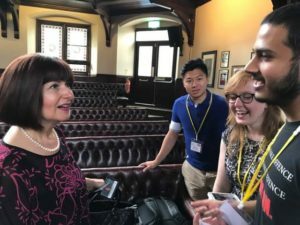 The Global Scholars Symposium (GSS) is an annual four-day event that seeks to connect, inspire, and challenge postgraduate students in the UK. Founded in 2008, GSS brings together some of the world’s most accomplished and promising scholars to connect with remarkable global leaders in a focused setting. He shares his experiences below. Difference of opinion must necessitate debate and dialogue but in today’s time it compartmentalises individuals in environments unsuitable for any discussion. This has led to gaps in societies the world over and therefore, the choice of “Mind the gap” as the central theme for the three day long Global Scholars Symposium (GSS) was in sync with contemporary times. The GSS comprised 100 students from all over the World pursuing different post-graduate courses on various scholarships studying in the United Kingdom. Our generation of academicians and change-makers carries the responsibility of not only being mindful of these gaps but also of bridging them well. We spent many hours at the Cambridge Union brainstorming about many of these gaps and ways in which we could bridge them. We started with Lord John Bird’s passionate keynote address, where he shared with scholars his first-hand experience with poverty. He implored his young audience to aim and strive towards poverty prevention and not gloat over poverty alleviation techniques, arguing that they are designed to inculcate dependence and perpetuate poverty. He explained how charity reinforces procrastination as he shared how he started the “Big Issue”- a news magazine sold by homeless individuals, that gave them a channel to redeem living with pride and dignity. From minding the gap between poverty management and poverty prevention we then moved on to our first panel on “Deconstructing the Ivory Tower”, where each panelist outlined what they meant by an “Ivory Tower”. The panel offered competing and yet insightful narratives to justify their interpretation, that ranged from the need to preserve Ivory Towers to incubate reasoned academic opinion to the need to completely eliminate them and replace them with safe spaces for free speech. The panel also grappled with the act of balancing quality of academic opinion with enhanced access to all sections. Each panelist underscored the importance of reaching out to public opinion and help shaping it with reasoned commentary to bridge its gap from the “Ivory Tower”. What followed next was an intriguing presentation by Dr. Samantha Nutt, who showed how most places of conflict are located in weapon importing global south and most weapon exporters are developed countries. Pointing out how even the permanent members of the UN Security Council gain from the economy of conflict, she appealed to global scholars to do their bit to pressurize their Governments to have arms trade regulations in place. From one difficult gap we navigated to an even more pressing gap- that of climate justice. The panel discussed the Paris Accord, the silver lining in India and China over-achieving their stated targets and the dark cloud in the form of the new US administration dilly-dallying on its commitment to the accord. The concluding keynote address of Day 1 by celebrated transgender woman activist Precious Davis gave the GS S -2017 its own mantra that reverberated on all three days, “We are the ones we have been waiting for!” She called upon her audience to appreciate diversity, overcome our deepest fears, rebel against oppressive conformity and to live in our own skin. Her session made each one of us suddenly think about the gaps in our own lives and struggles and gave us the confidence to overcome them. The second day of the conference started with an inspiring talk by Nobel prize winner and Taliban conqueror Malala Yousufzai’s father, Ziauddin Yousafzai. Now known for being Malala’s proud father, Zia, who has been a career diplomat had the courage to keep his school in Swat Valley open even during Taliban occupancy. Malala’s mother accompanied him and both of them identified “education” (not indoctrination) as the best strategy to mind the most divisive gaps in society. The panel discussion that followed deliberated upon the important trends and learning from current movements world-over. Noting that there was enough fodder to cheer as well as deplore in the mixed bag of global undercurrents, the panel discussed how one could identify correct sources of information and learn the right lessons. We then discussed the gaps between the uses and limitations of the concept of “allyship” in the next session, where we mooted on the most effective model of allyship, one that provides a push towards self-management of affairs rather than usurping of decision-taking authority. In minding these gaps of differing genres, by now one could inter-connect some of them- such as Lord Bird’s advocacy of constructive intervention to eliminate poverty was in sync with the general agreement in this session on allyship. In the concluding keynote address of the day, Professor Paul Davies left us spell bound by his presentation on how prejudice, stereotypes and discrimination impact our daily living. Not only did he present extensive statistics and data out of his own fieldwork, he conducted an impromptu test on his audience that involved identifying the perpetrator of a crime, which we failed miserably. This indicated to us that there might be gaps so built into our lives that it might take special efforts in merely finding out about them. O ur final day at the Cambridge Union started with Tarell Alvin’s keynote on how he used his platform as an effective writer to share stories left out of the mainstream. What followed was an engaging panel discussion on representation in popular culture, in which each panelist identified the “gaps”- that of objectification, entrenched stereotypes and pursuit not of quality but of audience eyeballs- the two often contradicting one another. The penultimate session of the GSS touched a raw nerve of many scholars, as the panel offered competing chronicles on “authentic peace building”. From Rwanda, to Venezuela, the panel dealt with the need of community participation, allyship that was not an unwelcome imposition and strategies that scholars can take back with them to combat threats to peace. As the symposium was drawing to a close, the proof of its success was in the somber discussions among scholars- we had identified so many difficult gaps that some of us were wondering whether any were even surmountable? All we needed was a concluding address by Simona Miculescu, (who had served as Romania’s ambassador to the United Nations) that was laced with an overdose of positive spirit. She shared with us in detail how the United Nations had not been an overall failure and identified specific noteworthy achievements to its credit. Her own life story of being a career diplomat (Romania’s first woman in many fields) from wanting to be an actor was one that we all heard in upbeat spirit. As she counted her achievements, Simona was equally candid about her challenges, especially in Baghdad. She asked us to never hesitate in following our hearts and told us how she started a rock band comprising different ambassadors to the UN and combined her hobby with UN’s message for peace. Apart from these sessions and keynotes, GSS 2017 also convened breakout groups simultaneously every day, which discussed various gaps in society in an informal setting in smaller groups. 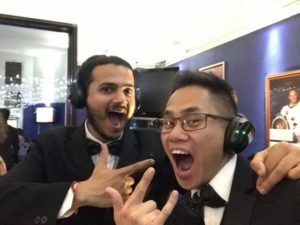 The formal dinner at Downing College, the silent disco and the open mic night also gave scholars from world over an opportunity to interact with one another. We learnt about each other’s work, ambition, passion, motivation and scholarship programs. 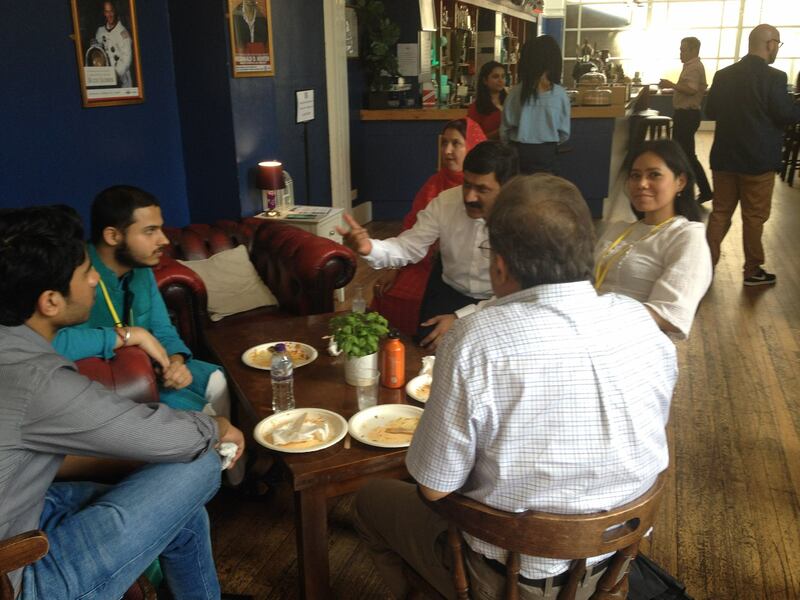 I returned to Oxford having made good friends from the Gates and Chevening scholarship communities and having interacted with students from almost all of UK’s reputed scholarships. Weidenfeld’s coveted leadership programme was a clear distinguishing factor for the Weidenfeld family and my friends from other fraternities found it one without parallel. “Minding the gap” was a formidable task made enjoyable thanks to the warm hospitality scholars received at the University of Cambridge and the sheer quality of participation in the symposium. The global scholars network has agreed to an action roadmap to follow up from where the symposium ended. Each participant returns to their host University and chosen course after being exposed to both, the gaps and the strength to make individual as well as collective efforts to fill them. 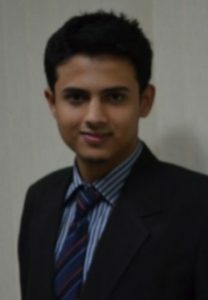 Abhijay Negi (Bachelor of Civil Law, 2016/17) is a Louis Dreyfus-Weidenfeld and Hoffmann Scholar. You can read another blog post by Abhijay here.